We're making an urgent appeal to our friends and donors to support the relief efforts in Regent/Freetown, Sierra Leone. The death toll from the massive mudslide is reaching 500, with perhaps another 600 still missing. 6 weeks of heavy rains have flooded the entire region, displacing 20,000 people including 5,000 children. There is a great risk of another massive mudslide that could affect an additional 70 acres of mountainside communities. Our goal is to raise $8,000 to $10,000 to assemble a large shipment of goods to support the community. We're collecting more clothing, medical and other supplies for the relief effort, but what we need most are cash donations to cover the cost of shipping and port fees. Bobby Smith's plan is to receive the container(s) in Sierra Leone and distribute these goods personally to the families affected by this tragedy. Bobby Smith visited the Regent area of Freetown on one of his recent visits, talking with students and teachers at a few different schools in the area. Some of the kids in these photos were killed or are missing and certainly all of them will be affected by this ongoing tragedy. Access to clean water will be particularly difficult in the wake of the landslide. The cost of food has spiked considerably and families can't afford even basics like rice and oil. The challenges in Regent will continue for many months to come. Please DONATE TODAY to help us pay to ship the goods we've collected. It takes 4-5 weeks from the ship date for the container to arrive, so please DONATE NOW! 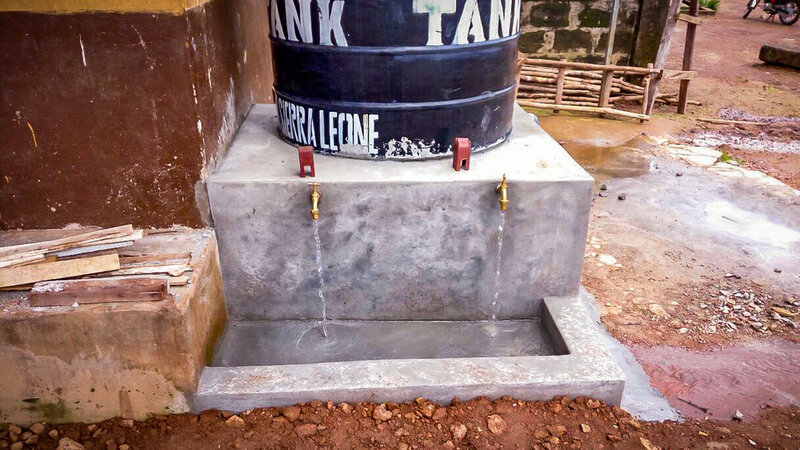 The new water station and well at St. Anthony's School was completed just in time for the new school year. We're so grateful to Bishop Fitzgerald School, Action4Schools and Water4Foundation for donating the funds and coordinating construction of the new well.